To make the paneer, line a sieve with a large piece of muslin and place over a bowl. Heat the milk in a large heavy-based pan over a medium heat. Gently bring to the boil, then reduce the heat to a gentle simmer. Gradually add 4 tablespoons of lemon juice, stirring continuously so the curds and whey separate. Carefully pour the mixture into the sieve so the curds collect in the muslin. Place under cold running water to get rid of any whey, then gather up the muslin and squeeze out the excess moisture. Keeping the muslin bundle in the sieve, cover it with a plate and top with a few heavy weights (a couple of tins work well). Place in the fridge for 1 hour 30 minutes to set. Once set, cut the paneer into 2cm chunks. Heat a lug of oil in a large non-stick frying pan over a medium heat, add the paneer and fry for 5 minutes, or until golden, stirring frequently. Using a slotted spoon, transfer to a double layer of kitchen paper to drain. Peel and finely chop the onion, garlic and ginger. Return the pan to a medium-low heat, adding a splash more oil, if needed. Add the cumin seeds, fry for 1 minute, then add the onion and cook for around 8 minutes, or until softened. Stir in the garlic, ginger, garam masala and turmeric. Halve, deseed and very finely chop the tomato, add to the pan and cook for a further 10 minutes, or until softened but not coloured, stirring occasionally. 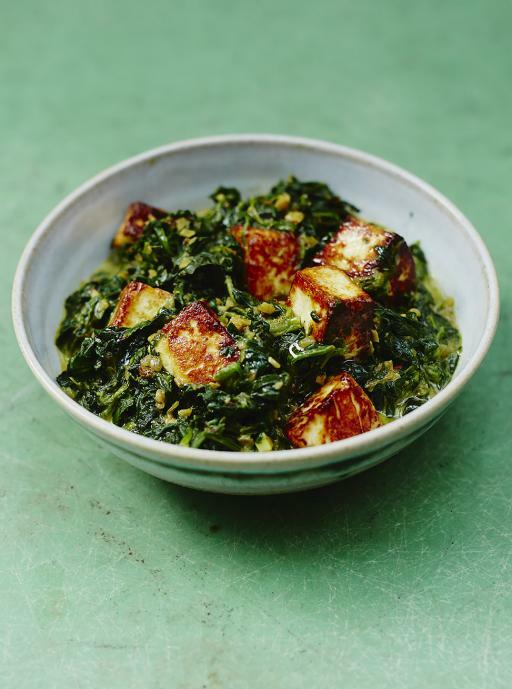 Stir in the frozen spinach, cover and cook for 5 minutes, then stir in the cream, paneer and a splash of boiling water. Reduce the heat to low and cook for a further 5 minutes with the lid off, or until reduced to a deliciously creamy consistency. Season to taste and serve immediately. Spinach, a very common and nutritious ingredient, is widely seen in Chinese, Western and Indian cuisine. It contains high content of water and non-soluble fiber, which are good for preventing constipation. In terms of nutrients, spinach is rich in potassium and calcium, which are good for your blood pressure. In addition, spinach has large amoun of vitamin A, Bs and C. A is good for your eyes, Bs makes you energetic and C is a anti-oxidant. Perhaps you will worry that since spinach contains oxalic acid, calcium oxalate derived from it will give you bitterness, and more seriously, turning into to renal calculus. In fact, there is a low chance that calcium oxalate from food will change into kidney stone. If you really want to lower the calcium oxalate, you can boil the spinach for a while before cooking it with other ingredients. With boiling it, oxalic acid will be loss in water, the bitter taste will decrease as well. On greaseproof paper, score the mackerel on both sides at 2cm intervals down to the bone. Slice the tomatoes any way you like and arrange on a large board or platter, then finely slice and sprinkle over the chilli. Lay the crispy fish on top. Mix the yoghurt and horseradish together and dollop it over the fish. Pick over the basil leaves and serve. Mackerel is a common ingredient in Japanese family and restaurants. 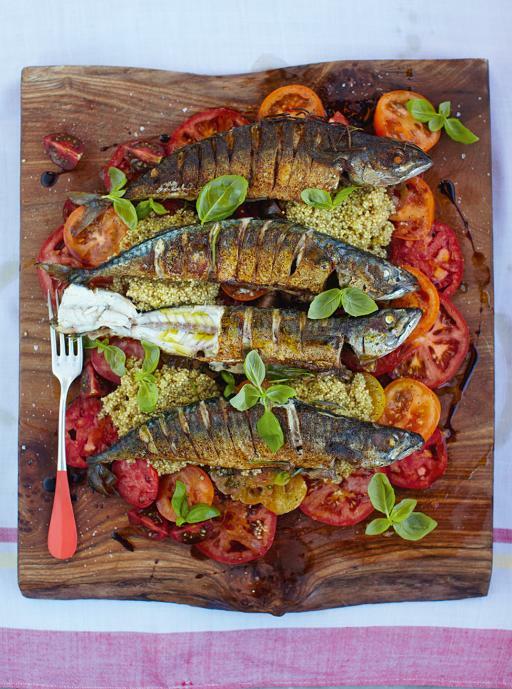 A high fat content is the biggest characteristic of mackerel among fish. It makes it suitable for grilling with salt or stewing. 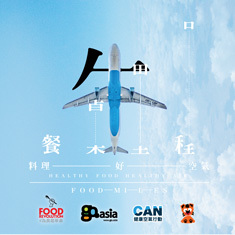 100g of raw Atlantic mackerel contains about fat 13.9g, protein 18.6g. On the other hand, mackerel is rich of polyunsaturated fatty acid, including omega-3 fatty acid, which can lower LDL, maintain cardiovascular health and relieve inflammation. Mackerel also contains a high amount of phosphorus, which is important for body electrolytic balance and energy formation. Since you can still find sustainable mackerel in the market, it is nice to enjoy it regularly. First things first: remove the stalks from the aubergines, slice them up into 1cm thick slices, and put to one side. Whether you’re using a griddle pan or a barbecue, get it really hot. Meanwhile, put 2 or 3 lugs of olive oil into a large pan on a medium heat. Add the onion, garlic and dried oregano and cook for 10 minutes, until the onion is soft and the garlic has a tiny bit of colour. If you’re using tinned tomatoes, break them up, and if you’re using fresh tomatoes (which will obviously taste sweeter and more delicious, if they’re in season), very quickly prick each one and put them into a big pan of boiling water for 40 seconds. Remove from the pan with a slotted spoon and put them into a bowl of cold water for 30 seconds, then remove the skins, carefully squeeze out the pips and cut up the flesh. Add the tomato flesh or tinned tomatoes to the onion, garlic and oregano. Give the mixture a good stir, then put a lid on the pan and simmer slowly for 15 minutes. Meanwhile, grill the aubergines on both sides until lightly charred – you may have to do them in batches, as they probably won’t all fit into your griddle pan in one go. As each batch is finished, remove them to a tray and carry on grilling the rest until they’re all nicely done. When the tomato sauce is reduced and sweet, season it carefully with salt, pepper and a tiny swig of wine vinegar, and add the basil. You can leave the sauce chunky or you can purée it. Get yourself an earthenware type dish (25 x 12–15cm). 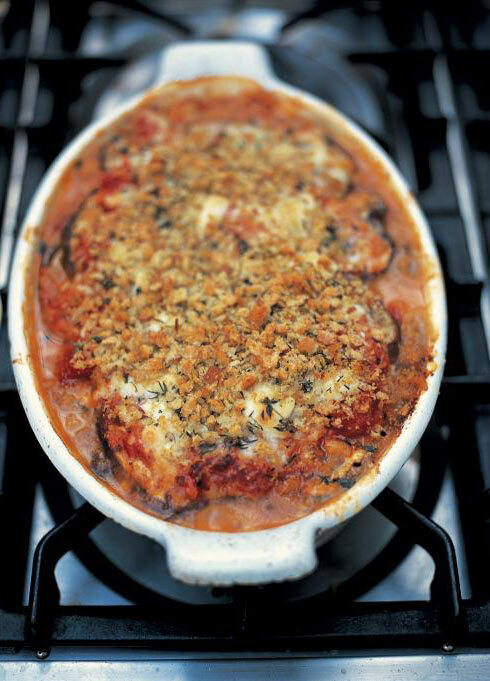 Put in a small layer of tomato sauce, then a thin scattering of Parmesan, followed by a single layer of aubergines. Repeat these layers until you’ve used all the ingredients up, finishing with a little sauce and another good sprinkling of Parmesan. I like to toss the breadcrumbs in olive oil with a little freshly chopped oregano and sprinkle them on top of the Parmesan. Sometimes the dish is served with torn-up mozzarella on top, which is nice too. Aubergine is a nutritious and low-calorie ingredient. 100g of raw aubegine contains water 92.3g, carbohydrates 5.9g and fiber 3g. Fiber contained is mainly water-soluble. Therefore, it functions well in lowering your lipids and cholesterol consumed in food. However, it is also a factor that aubergine absorbs oil easily. Therefore, in terms of health, it is not suitable to use a large amount of oil to cook aubergine. On the other hand, aubergine contains rich potassium and anthocyanidin. Potassium is important for electrolytic balance and normal blood pressure, while anthocyanidin is a natural anti-oxidant, which is exceptionally good for your eyes. Since the purple color of aubergine is contributed by anthocyanidin, if you would like to maintain the purple color, you can add a little soda in cooking or prevent high heat cooking for a long period of time.